RICHMOND – No one on the Richmond girls basketball team could hit a shot. Not a jumper, not a runner, not a layup. Somehow, the mystifying slump affecting all of the Bobcats skipped Hannah Moholland. And the senior provided her team all the help it needed. 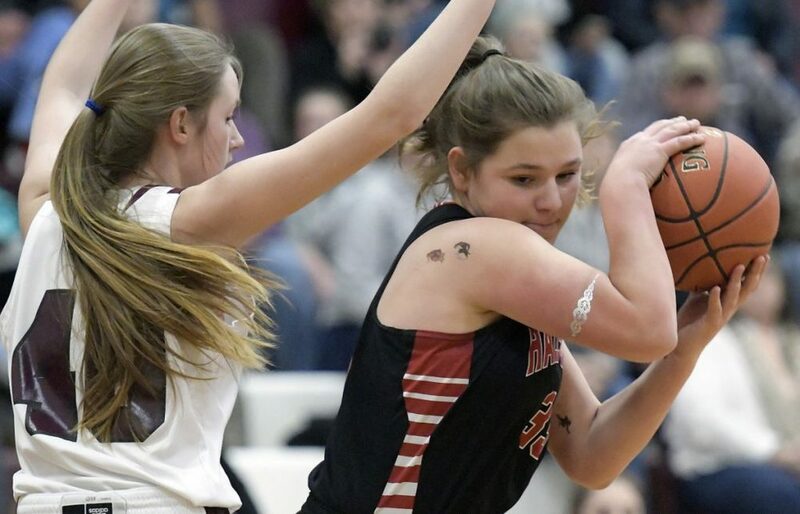 Moholland scored 20 points, helping Richmond stay afloat during an ice-cold first half and leading the Bobcats to one of their biggest wins of the season, a 45-27 decision over Mountain Valley Conference rival Hall-Dale. With the win, the Bobcats continued what’s been a late surge. Winless through six games, Richmond has touched the .500 barrier at 7-7. Caitlin Kendrick added 14 points for the Bobcats, while Macy Carver scored 10. Bryanne Lancaster had 10 rebounds. Iris Ireland had 11 points and 12 rebounds to lead the Bulldogs (8-5), who were struck by the same offensive woes that ailed Richmond — though coach Jarod Richmond said that was largely the Bobcats’ doing. The defense was clicking, but the Bobcats were slumping on offense from the opening tip. Richmond shot 1-of-9 from the field en route to a 7-2 first-quarter deficit, and missed 14 of its first 15 shots altogether. Suddenly, Moholland, a transfer from Oceanside, stepped up. She knocked down a pair of 3-pointers, the second of which gave the Bobcats an 8-7 advantage with 3:56 left in the second quarter, and she had nine points by halftime as Richmond took a 15-8 lead into the break. She didn’t cool off in the third, scoring 10 points in the period, and this time her team followed suit. After going 5-for-27 from the field in the first half, Richmond went 7-for-15 in the third quarter alone, mounting a 34-15 lead and setting up an easy fourth quarter.